In the 13th-century, western Europe rediscovered Aristotle's books on natural philosophy, or natural science ('Libri naturales'), and this caused an intellectual revolution. Despite being banned in Paris early in the century, they quickly became part of the curricula of universities. Oxford, where this manuscript was probably made, was a leading centre for the study of Aristotle. All students had to read set texts of Aristotle's treatises with commentary, of which this book is an example. It is exceptional, though, because it is quite richly decorated with unusual images. Furthermore, it belonged to Nicholas of Cusa, a German theologian and cardinal, in the 15th century. A page from the textbook reflects the effort with which Aristotle was read. He wrote in a notoriously difficult style, and the text concerns ideas and principles rather than concrete discussion on Christian texts. Aristotle's text is written in larger letters in the centre of the page. 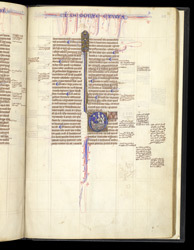 The wide margins are divided into three sections, to hold the commentaries which are coordinated to Aristotle via the red and blue markings. Further notes on individual words and phrases are in tiny writing between the lines. This sophisticated layout was developed from manuscripts of the Bible and Church Fathers (such as Augustine and Jerome) which had extensive explanatory notes (gloss). The picture in the first letter of Aristotle's 'On Death and Life' ('De Morte et Vita') shows a priest sprinkling holy water over a corpse, an image probably inspired by pictures of the Office of the Dead in contemporary books of hours.